This datasprint is aimed at understanding the city of Copenhagen in 1885 as a phenomenon (its people, its streets, its stories) through digital methods and a variety of data sources. It works through getting people from different backgrounds together for collaborating on this topic, developing research questions, sharing competencies and learning from each other. It will provide a stepping-stone into digital humanities and contribute to new research networks. Who is the datasprint aimed at? For example you could learn to make a map like the map above. The map examines whether there was geographic segregation of mionority religious communities in the city. It is made on the basis of processed and refined data from the 1885 census from Copenhagen and Frederiksberg. The census will be made available for the datasprint. 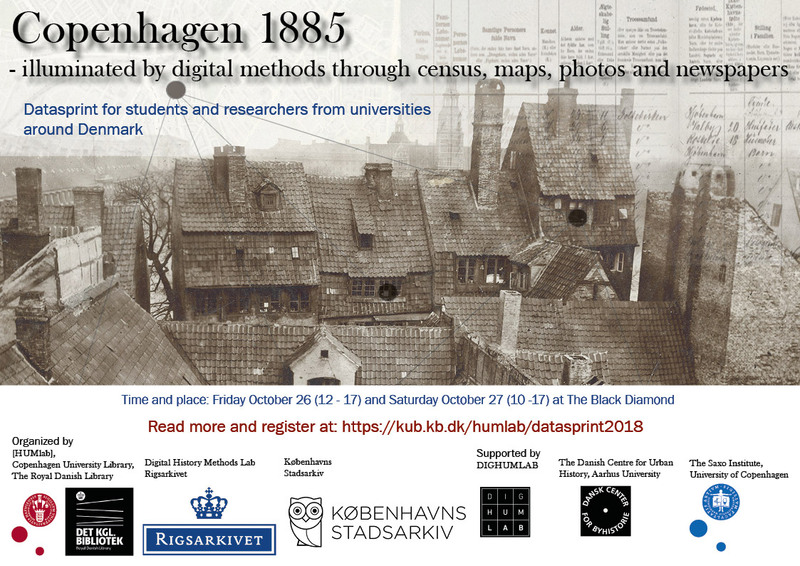 It is organized by Rigsarkivets Digital History Methods Lab and The Royal Danish Library's HUMlab, who disseminate their collections through training in digital methods, with the collaboration of Copenhagen City Archives. It is also supported by DIGHUMLAB and different departments from The Royal Danish Library, the University of Copenhagen, and Aarhus University. People have asked why 1885? Why chose that year? The late 19th century is one of the most interesting moments of change in the city. The walls were coming down, letting the city expand to the west, old and new practices started to co-exist in its streets and there is a wealth of data sources. In particular, the special census of 1885 that was only carried out in Copenhagen then 1885 offers one of the best sources of data. We form the teams so they consist of people from different academic fields, and we will assign team members with different roles. Each team is assigned a task that they will work together to solve. Based on the datasets we wish you to create a digital presentation that illuminates one of the assignments below. You could click on the links and read an elaborated description of the tasks. For example you could learn to do a map like the one you'll find on this page called "Mapping of religious community data from Copenhagen and Frederiksbergs census 1885". Digitized demographic data, literature, maps, and photos from the collections of various institutions. You can browse the data online at the Danish Demographic Database (www.ddd.dda.dk). You can also get the data extraction by writing to Lars Kjær, lakj@kb.dk after registering. You are of course welcome to use other kinds of software as well. But we'll provide a introduction to the software mentioned above.